Jaded Star's debut album Memories From The Future has generated some questions for me to ponder. One, by what merits does an artist or band get signed to a label? Also, do band's actually listen to the final product after recording, mixing, and mastering has been done? But I'm getting ahead of myself. 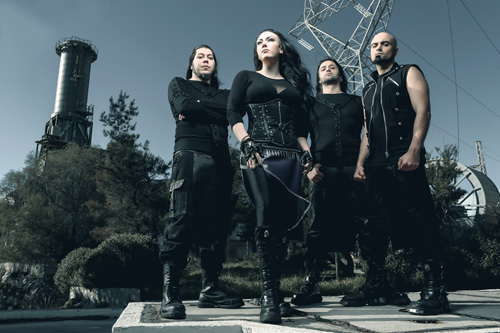 By way of introduction, Jaded Star, from Greece, is a female-fronted heavy metal band created by ex-Vision of Atlantis vocalist Maxi Nil and drummer Raphael Saini (ex-Iced Earth). He found guitarist Kosta Vreto (Horizon�s End, Wardrum) and bassist Babis Nikou (Astral DNA, Opened Paradise, Dia Mageias) to complete the line up. Aside from the female vocals, their version of metal is basically melodic heavy metal, touched by power metal, with an overall bombastic presence largely from the riffage. But returning to my questions, here's the problem with Memories From The Future: whoever pulled the final product together did a terrible disservice to Maxi Nil. She's barely heard in the mix. Her voice so blends with the sharp guitar tone to become simply not understandable and nearly crushed. The music isn't all that bad, actually, better than run of the mill heavy metal. Some quirky keys, really nice guitar solos. Yet, because Nil's vocals are defeated, this album is nearly dead on arrival. So did Jaded Star actually listen to the final product before casting a line to the sharks in record label ocean? I wonder. And did Sensory Records even listen to this album? If they did, I can't believe they didn't send the band back to the studio, or a least to the mixing/mastering board, to try again. And where was Fredrik Nordstrom? He did the mixing and mastering? The guy's a genius. Something went wrong here. Ultimately, I think Jaded Star has promise, a bright future and, even though female fronted bands aren't my first choice in heavy metal, I liked their music. But something needs to be fixed before I listen again. What could have been a potentially dynamic debut, Jaded Star's Memories From The Future is nearly DOA, thanks to Maxi Nil's vocals being crushed in the mix.